Last fall, I was so blessed to have an amazingly close encounter with a mamma black bear and her little cub. They just sat there for what seemed forever, just hanging out, sleeping, eating, and posing perfectly for my camera. As soon as I got home, I painted this piece. I love the emotion that black bears have in their eyes. I tried to capture that in this painting. I was so excited as the painting just smoothly unfolded and the color and detail combined just how I wanted. 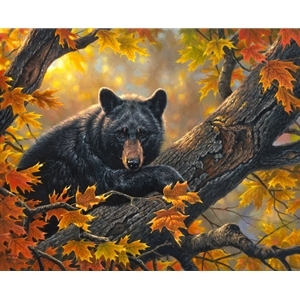 Every time I see this painting, it reminds me of those beautiful bears that day in Cades Cove in the Smoky Mountains. I'm so very happy with this painting and so excited to get to share it with you! I hope you enjoy it!